The Podee® Baby Bottle is a welcome solution to today’s busy, on-the-go parents. When it comes to feeding your baby, there is no better hands-free option. The Podee® Baby Bottle is a complete system that includes an 8-ounce BPA-Free baby bottle and all the necessary parts. 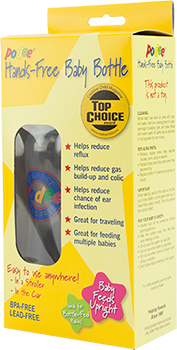 It ends dropped bottles and allows for upright feeding to help reduce ear infections and colic. Parents have found it to be very reliable in feeding infants with challenges as well. Our parents love to use the Podee® baby bottle in strollers, car seats and bouncies; or whenever they need an extra hand. Our unique, adaptive flow system allows the baby to manage the pacing and amount of flow with ease, making feeding time with the Podee bottle, always a pleasure. Even Oprah had immediate success with the Podee bottle when she helped a mother of 4-month old quadruplets during feeding time on her show. Our baby bottles are BPA-Free and Lead-Free. The Podee® Baby Bottle is the original hands-free feeding system. We have over 20 successful years on the market. Want to hear from all of our happy users? Just read our parent testimonials. Become a distributor or shop today at one of our fine online retailers. The Podee Hands-Free Baby Bottle is the smart solution for anyone on the go and wanting to help prevent gas and colic. 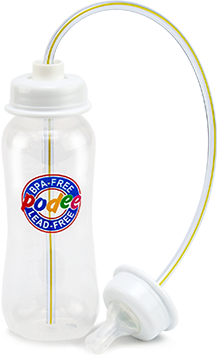 All of the Podee Baby Bottle products are manufactured to be BPA and lead free to keep your baby safe. The Podee Baby Bottle product line has kits to convert your existing baby bottles into a hands-free bottle.